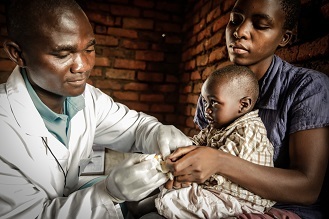 In 2015, the DRC Ministry of Health wanted greater visibility into the barriers between provincial medical stores and the individual health centers. VillageReach and the World Bank, with financial support from Gavi, conducted an assessment of the supply chains in two remote provinces, Equateur and Tshuapa. The findings and recommendations of the assessment sparked the curiosity of health officials, who began to pursue innovative ideas for improvement. Working with leaders at the last mile, in places notoriously difficult to reach, is expected to yield lessons relevant for supply chains throughout the country. Catalytic funds from the Bill & Melinda Gates Foundation enabled system design and modeling work in Equateur province – developing the evidence needed to begin implementing creative solutions in one of the most remote provinces in the country. 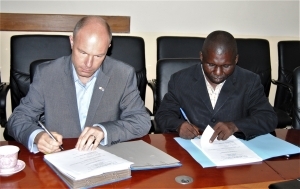 The Ministry and VillageReach signed the NGCA agreement. As the momentum behind this effort grew, more partners expressed interest and became involved. The resulting implementation plan will create the core of the new NGCA initiative (Nouvelle Génération des Chaînes d’Approvisionnement, or New Generation of Supply Chains in English). This work has been shaped in part by similar work VillageReach has done in other countries in sub-Saharan Africa to design and implement next-generation supply chains, maximizing availability of products and efficiency of resources. Over the next year, the NGCA initiative will increase access to a range of medicines in several health zones, as well as provide the information needed (e.g. stock levels, etc.) for more informed decision-making at all levels. The NGCA initiative results from investment by the Ministry of Public Health in its supply chains. The Ministry will not only dedicate time and staff to the NGCA initiative, but will also dedicate funds through the PDSS project (Project de Développement du Système de Santé – financed by the World Bank) to support VillageReach technical assistance. The PDSS brings together several partners such as the World Bank, Global Fund, Gavi, UNFPA, UNICEF, and USAID – to support the Ministry’s efforts to improve maternal and child health services in eleven provinces of the DRC. Collaboration between these major donors and the consolidation of resources streamlines the process for government decision makers to prioritize and address barriers to the health system. The NGCA initiative is an ambitious program with a reach far beyond the direct impact it will have on the ~2.5 million citizens of Equateur. Because the project is government-led and supported by a wide range of donors, this program is laying a foundation of supply chain transformation. The lessons will reinforce that supply chains can be optimized and sustained – even in the most challenging contexts. Beyond the PDSS project, other organizations including UNICEF, WHO, PATH, SANRU, and the European Union have invested knowledge, expertise, and interest into the success of this initiative. 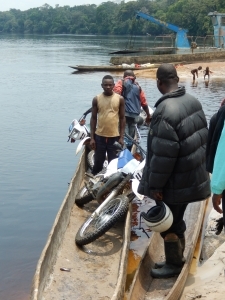 While continued leadership from political leaders and health officials will be the driving factor for supply chain transformation in the DRC, it is through this type of coordinated network of partners that the NGCA initiative has the potential to influence supply chain improvements beyond Equateur province. Partnership is about more than shared resources. Collaboration is strongest when strategies are aligned, duplication is avoided, priorities are clear, results are measured consistently, and each partner’s contributions are maximized. Collaboration is the key to success for the NGCA initiative. It will ensure better use of resources and greater opportunity to develop repeatable solutions instead of discrete, stand-alone projects. The additional cooperation will amplify the impact and future scalability of the NGCA – leading to increased availability of lifesaving vaccines and medicines where they are needed most.